Marubeni Private Real Estate Investment Trust | Marubeni Asset Management Co., Ltd.
Marubeni Private Real Estate Investment Trust aims to build a diversified portfolio based on the best investment decision assessing the “intrinsic value” of real estate, utilizing the integrated capabilities of information gathering/analytical capabilities, property development/acquisition capabilities and operational capability that Marubeni Group, being a general trading company, can present. Marubeni Private Real Estate Investment Trust began asset management as a private REIT in September 2014. Operation and investment decision making of Marubeni Private Real Estate Investment Trust are conducted by Marubeni Asset Management Co., Ltd., of which the management team and key executives are comprised of personnel assigned from Marubeni. 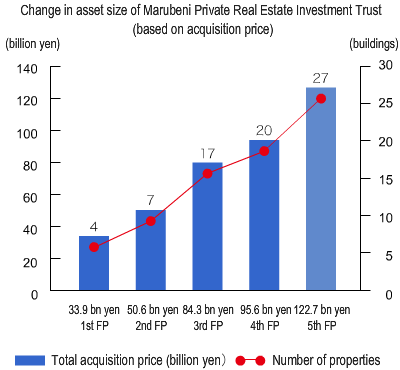 The asset size of Marubeni Private Real Estate Investment Trust grew from around 32 billion yen at the start of management to 122.7 billion yen (as of January 31, 2017). The size of assets under management including the private funds of Marubeni Asset Management is 213.6 billion yen (as of March 31, 2017).